The latest performance mirrors an industry trend, which saw most ECNs and trading venues secure growing volumes in September. Thomson Reuters (NYSE:TRI) has reported its monthly trading statistics and volumes for September 2017, which printed a three-year high of $411 billion per day. The month was characterized by a number of influential factors across global markets, including interest rates and fiscal policies speculation in both the US and Europe, which ultimately helped spark volatility. Relative to a rather uneventful August, September 2017 proved to yield a far more dynamic market for FX. In the United States a combination of factors ranging from the “Trumpflation trade” to expectations for U.S. interest rate hikes helped spur markets, the company said. 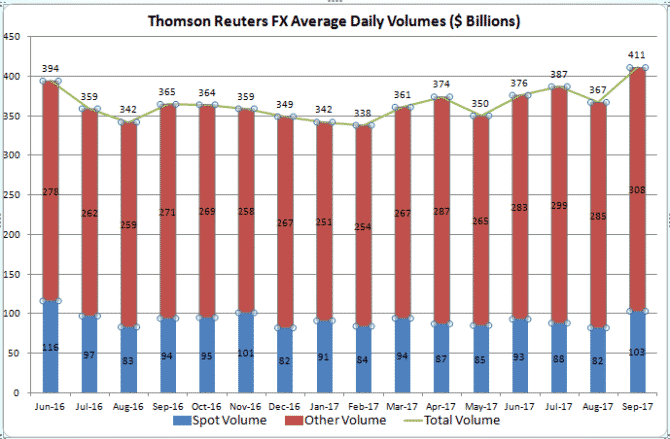 In particular, Thomson Reuters saw a total average daily volume (ADV) of its foreign exchange (FX) products, including spot, forwards, swaps options and non-deliverable forwards (NDF), coming in at $411 billion, an increase of 7 percent year-over-year from $365 billion in September 2016. Additionally, the figure was higher compared to August 2017, marking a gain of 11.9 percent month-over-month from $367 billion the month earlier. Of the $411 billion, $103 billion was FX spot, the highest since June 2016 and also representing a notable advance over both monthly and yearly intervals. The latest figure reflects a 25.6 percent rise from the $82 billion set back for FX spot volumes in August 2017. On a year-over year basis, spot volumes were also pointed higher after managed to overcome the $94.0 billion reported a year ago – this was a march higher of 9.6 percent year-over-year. Other transaction types – including forwards, swaps, options and non-deliverable forwards (NDFs) – averaged $308 billion daily, up 8.07 percent from $285 billion the previous month. The latest performance follows an industry trend, which saw most ECNs and trading venues secure growing volumes in September.